Ubiquitous fruitcake. Despised, rejected, derided, mocked. If holiday foods have a jester, a whipping boy, a guilty pleasure, it's fruitcake. There seem to be two types of people in the world: those who adore fruitcake, and those who despise it. There is very little middle ground. No one seems merely to like it. Even Johnny Carson famously said that he believes there to be only one fruitcake in the world, and everyone keeps passing it off as a gift, year after year. Even as I laughed at his joke, I knew that was untrue. Back home, we had a stack of empty red tin boxes from the mail order mavens at Collin St. Bakery in Corsicana, Texas. Despite fruitcake's bad rep, I couldn't actually say why or even if I hated it. In search of answers, I did not fool around. I went straight to the experts - a group of friends who for one reason or another were fruitcake dropouts. What's not to hate, said two, one from Ohio and one from Georgia. Fruitcake, as they know it, has the texture that combines dubious fruit with dense, decidedly non-cakey cake and soggy nuts. They hated the long laborious process of baking the darn things, and they had tried - really they had. On the other hand, one of the dropouts was a closet fruitcake lover from Hawaii who sighs over fond memories of her early marriage when they made do with just a rum cake. What she really craves, however, are huge, fat glazed cherries, sitting on top of a rich fruity cake soaked in brandy or rum, accompanied by a strong cup of coffee. But fruitcake has been just too hard to bake. And then, a dropout from Pennsylvania (from a town very close to Hershey) stoically observed that the ideal fruitcake would be moist, chock full of crunchy nuts and brandy-soaked fruit - hold the citron and pineapple - and (ready for it?) it would be chocolate-based. At that moment, I felt like I'd won the lottery because I quite possibly have the recipe for The Perfect Fruitcake. Buried treasure, chocolate gold, a potentially life-saving fruitcake recipe that masquerades as a "spice" cake (or as my father calls it, "booze" cake). Could my mother's cocoa-based "Old Fashioned Christmas Spice Cake" be the bridge over troubled fruitcake? I went through the dropouts' checklist. My mom's recipe is chock full of nuts. It has brandy or rum, (or coffee, cook's choice). There are no ancient, candied cherries, citron or pineapple (what are the green things again?). 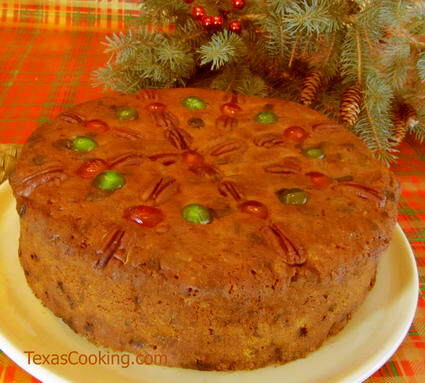 With its lovely golden raisins and dates, its tipsy walnuts and pecans, it classifies in every way as a "fruitcake" with a moist and light cocoa-flavored cake base. By all means, try this recipe but you must promise me something, please. A Perfect Fruitcake could become a potent weapon in the wrong hands. This recipe could destablize some developing economy somewhere so be very, very careful how you present it. Make a small batch of cakes over Thanksgiving weekend and let them soak in brandy or rum for two or three weeks in the fridge. Then, oh so casually, slice some for visitors to sample. Or sneak it into the office potluck. But - and this is important - don't tell them it's fruitcake until their eyes light up and they ask for more. And after that, you'll just have to use discretion. Preheat oven to 350F degrees. Grease and flour two 9x5-inch loaf pans. Sift dry ingredients together in a large mixing bowl (you may use your stand mixer or a hand-held). Drop in the butter in cubes, and add applesauce. Beat until blended. Add eggs, and beat again until smooth and creamy. Add the fruit and nuts. Pour batter into prepared pans. Decorate with topping. Bake for 1 hour and 30 minutes. The cakes will look pretty done on top. The usual toothpick test is not too reliable because of the moisture in the fruit. After the cake has cooled, glaze with the liquor, cover tightly with foil, and refrigerate. Let soak at least overnight before serving but it is best to wait one or two weeks, glazing with more rum or brandy as needed. And my dad would say, "It's needed." Slice to serve. Optional: When serving, paint plate lightly with chocolate syrup. Jay Ann Cox is a food writer and Texan, living in exile near Lizard Lodge, Arizona.